We loved to travel by car in the 1960s, and the motels we stayed at were usually simple and affordable. They had the coolest signs, too! In the 1960s, the motel industry was in a state of transition. Modern motel chains were beginning to crowd out the old-fashioned roadside inns. When you pulled up to the motel office, the element of surprise was gone....weary travelers knew just what to expect when they saw a Holiday Inn or Howard Johnson sign along the road. Modern motel chains provided air-conditioning, swimming pools, restaurants, color TV, direct-dial phones and, above all, consistency. The Howard Johnson restaurant chain entered the motel business in 1954. Their orange and turquoise Motor Lodges were a familiar sight for travelers in the 1960s. Just pull your car up to the door! places to spend the night! 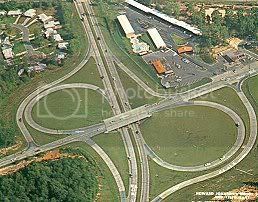 The American landscape in the 1960s: suburban housing developments, interstate highways and a Howard Johnson's at every off-ramp. In the 1960s, motorists began to choose the new interstate highways for long distance travel. The glory days of roads like Route 66 gradually came to an end, and many of the businesses and tourist traps that once flourished along the "Mother Road" fell on hard times. A typical vacation now included long stretches of uninterrupted travel on limited-access freeways. Kids passed the time by doodling on their magic slates and playing travel games. Mom and Dad scanned the horizon for the familiar "Gas-Food-Lodging" signs that promised welcome relief from the road. The phrase "Are we there yet?" became the unofficial slogan for long-distance travel in the 1960s. 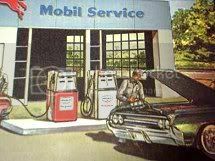 When you drove over the hose and rang the bell at the gas station, the attendant came out and did everything for you....filled the tank, cleaned the windshield and checked the oil! In addition to performing simple repairs, the typical station also sold motor oil and provided trading stamps and free road maps. Jet airliners were developed during World War II and were first used for commercial flights in the 1950s. Air travel increased in the 1960s, giving the era a new nickname: the jet age. There was a time when trains were the preferred method of long-distance travel. In the early 1960s, several famous cross-country trains were still running, including the California Zephyr and the Broadway Limited. A handful of electric interurban routes were also still operating between cities. By the end of the decade, many of the cross-country routes had been eliminated, and passenger trains were generally used only for commuting from the suburbs to jobs in the city. new interstate highways and a prospering economy. Las Vegas began its transformation from dusty frontier town to entertainment mecca in the 1940s. By the early 1960s, the glitz and glamour of the Vegas scene made it a top travel destination. During this decade, major corporations entered the world of casino ownership. This helped to transform the town's gambling industry from a small-time concern with mob ties to a legitimate big business. This was a crucial decade for the nation's amusement parks. Disneyland's theme park concept was catching on, and the industry was sitting up and taking notice. Larger parks began to update their images, while the older parks that couldn't adapt were left in the dust. In Ohio, Cedar Point embarked on a renovation project that would eventually make it the most popular park in the country. Other parks, like Riverview in Chicago, fell victim to the changing times and closed their doors. Gradually, the smaller parks were replaced by modern, corporate-owned mega parks. The future of the industry became evident with the opening of Six Flags Over Texas in 1961 and Six Flags Over Georgia in 1967. The world's fair showcased the technological marvels of today and the wonders of tomorrow. There have been many fairs since the 1960s, but this decade was really the last time that the American public found futuristic technology captivating enough to attend fairs in record numbers. Hawaii saw an increase in tourism after becoming a state in 1959, and tropical destinations in general became more popular, thanks to air-conditioning and jet travel. The popularity of ski vacations was also growing during this decade. Young families favored kid-friendly destinations that could be easily reached by car. During the 1950s and 1960s, newlyweds honeymooned in the Poconos, and many Jewish families from New York City spent their summers in the Catskills. In the 1960s, bigger was better and fuel economy was the farthest thing from our minds. Young people cruised around town in muscle cars, families piled into station wagons, and glamorous sophisticates enhanced their suntans in convertibles. putting chains on your tires in the winter? when the Volkswagen van was called a micro-bus? 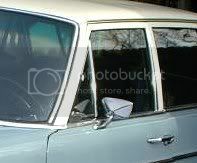 Side vent windows were small triangular windows that passengers in the front seat could push open. They were a standard feature on most car models, but in the 1960s they began to be eliminated. The 1966 Buick Riviera was the first car designed without side vents. The Pontiac Firebird and Chevy Camaro lost their side vents in 1968. In the energy-conscious 1970s, automakers removed side vents from the remaining models because they weren't aerodynamic.